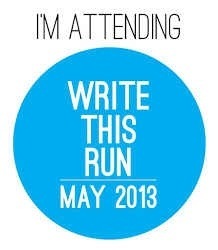 On 12th May I’ll be heading down to Surrey for an event called Write This Run. It’s an opportunity to meet up with some of my favourite running bloggers (as well as discovering a few new gems). The prospect of rubbing shoulders with some of the legends of running blogdom has got me so excited that, even as I type this, I’m fighting the urge to make that “squeeeeeee” noise that a certain type of woman makes when they see shoes, kittens or pictures of Hollywood hunks with untameable hair and a shirt allergy. Q: What’s your favourite running? Q: Your name’s Overall, but you always seem to be in shorts and vests. What’s that all about? (I’ll have to shelve that one on the day if he does actually turn up wearing overalls). Q: Who directed the seminal 1997 movie “Beverly Hills Ninja”? Q: I’ve seen some of your races on the telly. Why are you always in such a hurry? Okay, so in all seriousness I’ll just be sitting there, nibbling on a hobnob and quietly soaking up the awesomeness. Although Scott is arguably the most “celebrity” of all the speakers* he’ll be in some pretty mighty company on the day, including Stuart Amory and the totally amazing Mimi Anderson. As well as all the guest speakers, there’ll also be a chance for my fellow bloggers and I to go out for a run with Mr Overall. At the risk of sounding big-headed, I think he could stand to learn a thing or two from running with me. Mostly involving CPR, after I try to keep up with what, to him, is a painfully slow jog. Anyway, I’ll post again after the event to share all the pearls of wisdom I pick up. PS: Don’t forget, you can follow me around on twitter (@borntoplodblog) or check out my new(ish) Facebook page. * Just this week he was pictured in Heat magazine, falling out of a taxi and flashing his pants after an all-night absinthe party at China Whites with the cast of Midsomer Murders. 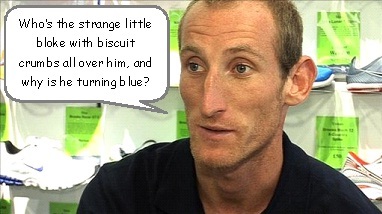 Looking forward to meeting you there Jay – but only if you share the hobnobs!! No way – the word “share” isn’t in my vocabulary. Seriously, it isn’t. I suffered a swingball-related concussion last night and I’ve forgotten LOADS of words. “Rhododendron” has gone too. And “cheese”. you forgot cheese?!? How could you forget such an important word of the English language? How will you ever ask for a cheese sandwich now? You won’t be able to, and you’ll forever only have two pieces of bread with nothing but butter between them! So wish bloody med school induced poverty and exams weren’t getting in the way of going to Write This Run! Nice one – Mimi is on my list of people I’d like to meet. Not only an ace ultra runner, but also shares my surname. Bonus! Have a good one Mr Plod. All you Southerners and your convenient and plentiful events that don’t clash with your race schedules…. Maybe next year. Enjoy!